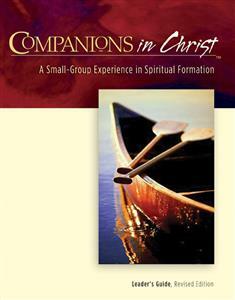 Companions in Christ Participant's Book in 1 Volume is available for small group members. Companions in Christ Leader's Guide is designed to develop you as a leader in guiding the spiritual life of your congregation. This resource gives you an overview of the Christian spiritual life and the practices that help people enter into the formative pattern of Christ's life: a life of prayer, study and service. Help your small-group members move from information (knowledge about) to experience (knowledge of) in the means of grace — ways in which Christ meets people, renews their faith, and deepens their life together in love. "I found that the Leader's Guide was complete, easy to use, and filled with a vast wealth of worship experiences and leadership tools," writes one Companions in Christ group leader. "I haven't found this content in other resources." Lead your group deeper into the heart and mind, the work and spirit, and the very life of Jesus Christ!